The world faces a ‘perfect storm’ of social and ecological stresses, including climate change, habitat loss, resource degradation and social, economic and cultural change. In order to cope with these, communities are struggling to transition to sustainable ways of living that improve well-being and increase resilience. This book demonstrates how communities in both developed and developing countries are already taking action to maintain or build resilient and sustainable lifestyles. These communities, here designated as ‘Ecocultures’, are exemplars of the art and science of sustainable living. Though they form a diverse group, they organise themselves around several common organising principles including an ethic of care for nature, a respect for community, high ecological knowledge, and a desire to maintain and improve personal and social wellbeing. "Ecocultures: Blueprints for Sustainable Communities is a much needed antidote to the many illnesses now pervading the planet. The earth is unwell and its temperature is rising. The contributors to Ecocultures give us good medicine and demonstrate that healthy cultures mean healthy people and a healthy earth." – Glenn Albrecht, environmental philosopher, former Professor of Sustainability, Murdoch University, Perth, Western Australia. "This book contributes novel perspectives on existing and emerging ecocultures across the world, offering hope and pathways for a more sustainable future." – Peggy F. Barlett, Goodrich C. White Professor of Anthropology, Emory University, USA; Co-editor, Sustainability in Higher Education: Stories and Strategies for Transformation and Editor, Urban Place: Reconnecting with the Natural World. "The contexts for the concerns of Ecocultures is the global polycrisis of ecological despoliation and human social inequalities. But this is not a despairing account of inevitable demise. Instead, the authors, drawing on the perspectives, practices and wisdom of traditional and emerging ecocultures across the globe, explore the possibilities of an interlinked Three Rs – Revisioning, Reconnection and Rebraiding – to achieve new ways of human wellbeing lived within and with a new planetary wellbeing. 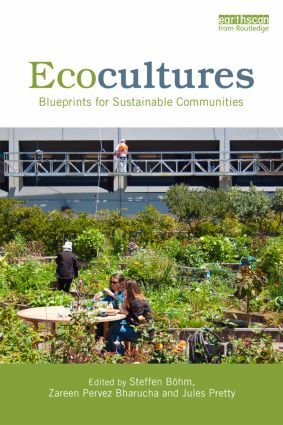 Ecocultures is a magnificent contribution to present debates about, and practices of, environmental ethics." – Garry Marvin, Professor of Human-Animal Studies, University of Roehampton, London, UK. Steffen Böhm is Director of the Essex Sustainability Institute and Professor in Management and Sustainability at the University of Essex, Colchester, UK. Zareen Pervez Bharucha is Senior Research Officer in the Department of Sociology, University of Essex and a member of the Essex Sustainability Institute. Jules Pretty is Professor of Environment and Society and Deputy Vice-Chancellor of the University of Essex.